During the holiday season, many of us worry that we won't be able to enjoy a seasonal dessert without feeling guilty and putting on a few extra pounds. Not to worry though with Terra's Kitchen's recipe for Vegan Pumpkin & Coconut Mousse. This smooth and creamy dessert will satisfy everyone at the Thanksgiving table without having to feel an ounce of guilt. Between the pumpkin, coconut and being at only 263 calories a serving, your guests will be coming back for seconds. Makes 2 Servings. #TKHack: Can't find coconut cream? Use the cream that rises to the top of a can of coconut milk. 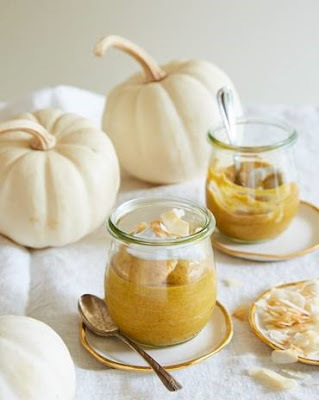 Make The Mousse: In a small mixing bowl, whisk together the pumpkin, ½ cup coconut cream, 2 tablespoons agave syrup, 1 teaspoon cinnamon, ginger, nutmeg and pinch of salt. Divide mousse between two jars, cover with plastic wrap and refrigerate a minimum of 2 hours or overnight. Make The Cream Topping: Just before serving, stir together the remaining coconut cream, remaining agave syrup and remaining cinnamon. To Serve: Place a small dollop of the topping on each jar of mousse and garnish with toasted coconut. I have never tried a completely organic vegan recipe like this one. It sounds interesting , but I am not sure it would satisfy my sweet cravings. I shall probably experiment with it some time in the next month.